We understand how difficult it can be to lose a loved one. Come in and visit Mike and he will explain how probate works, and help you avoid probate altogether whenever possible. Our goal is to help you efficiently handle your loved one's estate. For smaller estates, we routinely will handle probate for a fixed flat fee, so that you will know ahead of time how much your attorney costs will be. Our long experience in this area also teaches us that careful estate planning in advance can reduce costs and assure that your wishes are followed. Mike will explain how the probate process will impact your estate when you pass away, and help find effective ways to reduce probate costs. We will work with you to prepare a Last Will and Testament, a Living Will, and a power of attorney, and to help you craft a comprehensive estate plan. As part of this process, Mike will be happy to explain alternatives such as beneficiary deeds or living trusts, so that you can decide what fits your needs most closely. 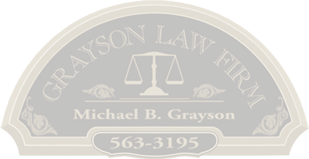 Please e-mail us at mbgrayson@graysonlawfirm.com, or call us at (406) 563-3195, or toll-free at (888) 888-3315, to make a no obligation appointment. We are willing to set up telephone appointments for our many out of town clients to save them the difficulty of traveling.